By now we've seen countless brands dive head first into the deep end of current politics. Some brands manage this with work as smart and effortless as a swan dive. Others, a big ol' belly flop. As the political waters heat up day after day, more brands are jumping in, shouting, "Come on in! The water's fine." As a student standing on the edge of the industry, I wonder whether brands should even be near the pool at all. Let's consider a few examples, starting with this little ditty from Reebok. 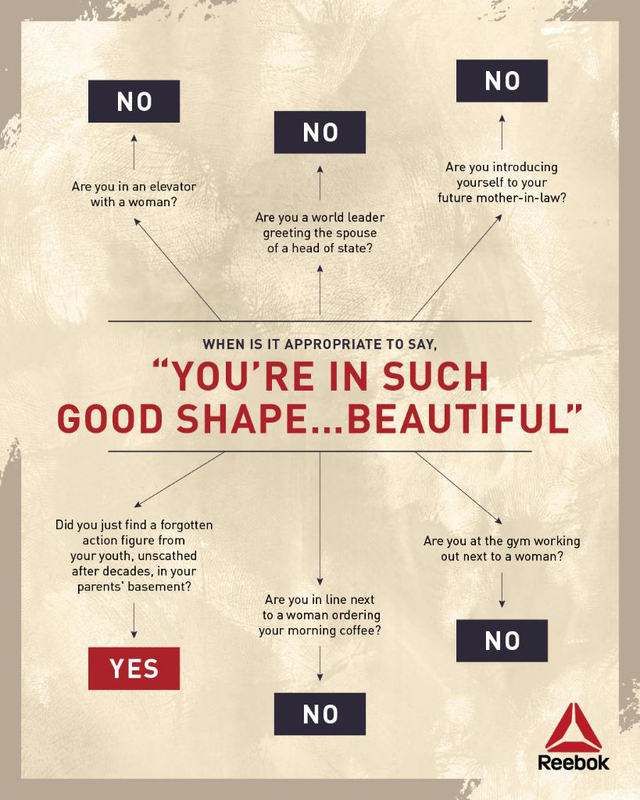 Made in response to President Trump's comment to the First Lady of France, which you can read about here, you can see this Reebok piece is a flowchart on when it's appropriate to make unsolicited comments about a woman's body. (Spoiler alert: never). If you'll let me pretend this wasn't made by Reebok for a second, I'm not disagreeing with its message. It's worth saying. I just want to know why Reebok thought they had to be the ones to say it. Here's what some might argue: Reebok sells athletic shoes and apparel. Women wear athletic shoes and apparel, and sometimes while they're wearing it, people give them unsolicited "compliments" about their body. Okay. Is that it? Maybe I don't get it, but for me, that's not enough. The tie to the Reebok is iffy (that's me being nice), and as a result, the work comes off forced and confusing. So, maybe that was a bad example. Peep this recent work from Smirnoff, which references, of course, President Trump's alleged ties to Russia. I'll be honest, I smiled when I saw this ad. I'm partial to anything with a little snark and this one pours it on thick. But wait! The thing I like best is that it makes sense for the brand, given their history. Just like the Reebok piece, it came as a dig at a statement made by Trump, but it stands just as well on its own. For better or worse, there are plenty more examples for me to talk about, but I'll get right down to it. Starting an important conversation through a brand could someday be a task for me, whenever I may break into advertising, and I'm good with that. If we can take an industry that, for the most part, gets people to buy things they don't need with money they don't have, and every now and then turn it into something bigger and better for the world, I'm into it. But ultimately what I've decided about brands and politics is this: if you're gonna do it, it has to track back to the brand, just like anything else. If they want to join in, brands should add value to the conversation. Otherwise they're just adding to the noise. Which reminds me of one of my favorite quotes: "Wise men speak because they have something to say; fools because they have to say something."